CAPE CANAVERAL, Florida -- The final solar eclipse of 2013 will occur on Sunday, November 3, 2013, and will be viewable from the U.S. East Coast. This will be a rare 'hybrid' eclipse made up of both an annular solar eclipse and a total solar eclipse in which some sections of the shadow path on Earth are annular while other parts are total. A partial eclipse with a 'ring of fire' will be seen from eastern North America, northern South America, southern Europe, the Middle East and Africa. 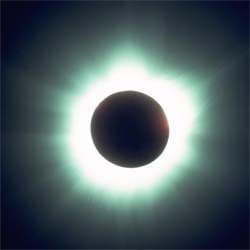 The total eclipse will occur over the Atlantic Ocean. According to NASA, the duality comes about when the vertex of the Moon's umbral shadow pierces Earth's surface at some locations, but falls short of the planet along other sections of the path. The unusual geometry is due to the curvature of Earth's surface that brings some geographic locations into the umbra while other positions are more distant and enter the antumbral rather than umbral shadow. In most cases of hybrid eclipses, the central path begins annular, changes to total for the middle portion of the track, and reverts back to annular towards the end of the path. However, the November 3, 2013 solar eclipse is even more unique because the central path to begins annular and ends total. The path of the Moon's shadow begins in the North Atlantic approximately 1000 km due east of Jacksonville, Forida. From the central line, a 4 second annular eclipse is visible at sunrise (11:05 UT). As the shadow races forward, the narrow 4 km wide path rapidly shrinks to zero and the eclipse changes from annular to total. This all transpires within the first 15 seconds of the shadow's trajectory. For the remainder of the track, the eclipse remains total. Boston, Massachusetts: 6:23 a.m. / 7:12 a.m.
Cape Canaveral, Florida: 6:40 a.m. / 7:03 a.m.
Hartford, Connecticut : 6:28 a.m. / 7:11 a.m.
Miami, Florida: 6:33 a.m. / 7:02 a.m.
New York, New York: 6:32 a.m. / 7:11 a.m.
Orlando, Florida: 6:42 a.m. / 7:03 a.m.